Dinosaurs may have been extinct for a long time, but they are still a fascinating subject today. They’ve been featured in numerous movies, TV shows, books, and even apps. They also happen to be the stars of developer Cowly Owl’s newest app, Dinosaur Mix. As you might have inferred from the name, in the app kids get to mix and match various dinosaur body parts to create something entirely unique. They also get to feed their dinosaurs, and watch them stomp around Jurassic landscapes. The app begins with kids tapping a bunch of eggs to reveal random body parts from various dinosaurs: Tyrannosaurus Rex, Spinosaurus, Triceratops, Stegosaurus and Brachiosaurus. They then tap or drag these body parts onto the dinosaur “blueprint” to assemble a whole creature. When the dinosaur has roared into life, kids can take their dinosaur out for a walk around the forest or volcanic plains. Both of these settings have interactive scenery and wildlife. For example, the volcanic plains allow kids to splash in puddles and incite smoke from a volcano. 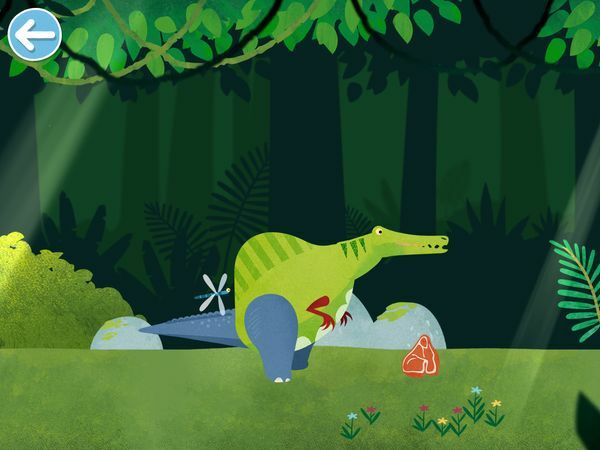 As the dinosaur roams around, kids can feed it with chunks of meat or leaves they find on the ground. Depending on the dinosaur head, it may refuse to eat the meat (if it’s a herbivore) or leaves (if it’s a carnivore). Kids will also occasionally run into eggs that contain new dinosaur body parts. They can choose to swap these for the ones they already have, or leave them. A sandbox-type app, Dinosaur Mix has no objectives or rules. Instead, it lets kids explore the app freely and at their own pace. By default, the app provides kids with different body parts to form a unique creature. But kids can make a “purebred”, with all the body parts from the same dinosaur, if they wish. The app is also child-friendly, with minimal controls. Kids can get through most of the game with just tapping. The app contains neither spoken nor text instructions, so kids of any reading skill (and language) can easily pick up the app. Dinosaur Mix does not contain in-app purchases, third-party advertising, and social media. 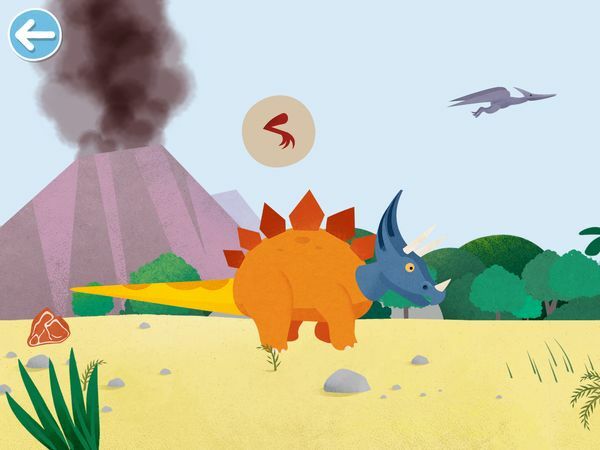 Dinosaur Mix is beautifully made with colorful graphics and adorable sound effects. I like how each dinosaur comes with a unique roar voiced by kids — very cute! The background music is also in line with the theme. For the most part, I enjoy the slow-paced and stress-free gameplay. I think it’s a nice change from the bright, bombastic apps I usually review. On the other hand, the simple gameplay may appeal more to toddlers than older kids. Finally, I like how the app allows kids to subtly learn about dinosaurs. Parents can use the app to discuss with topics such as what dinosaurs look like and why some dinosaurs prefer meat while the others eat plants. Dinosaur Mix is a silly sandbox game that takes kids back to the time of dinosaurs. Kids can mix and match various body parts to create a unique dinosaur, then watch (and listen!) as it stomps around beautiful and interactive landscapes. Serene and without goals or objectives, this is a great app for when you need to keep your kids occupied as you catch a quick break.